I’m not even a little bit ashamed to admit that I’ve been burning the candle at both ends recently. What’s a girl to do? Spring has sprung, love (well, cough, maybe not exactly love but you get the idea, right?) is in the air and there is so much to do in London right now. So many cocktails, so little time. So I was pretty relieved when Elemis brought out their double whammy under eye saviour, ‘See the Difference Eye Duo’. I’ve been using the Pro-Collagen Eye Renewal for a little while already and while I was happy with the results, there were times when I needed a little more brightening, tightening and all around TLC. Well, ta-da. 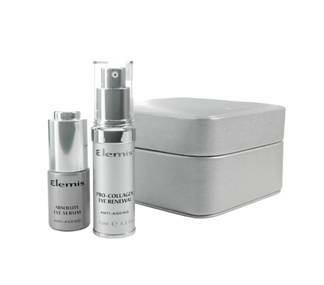 This kit includes not only the Eye Renewal but also the Absolute Eye Serum, containing rosewood, osmanthus, lavender and chamomile. And it’s amazing. Trick: How to fool the sun into shining!